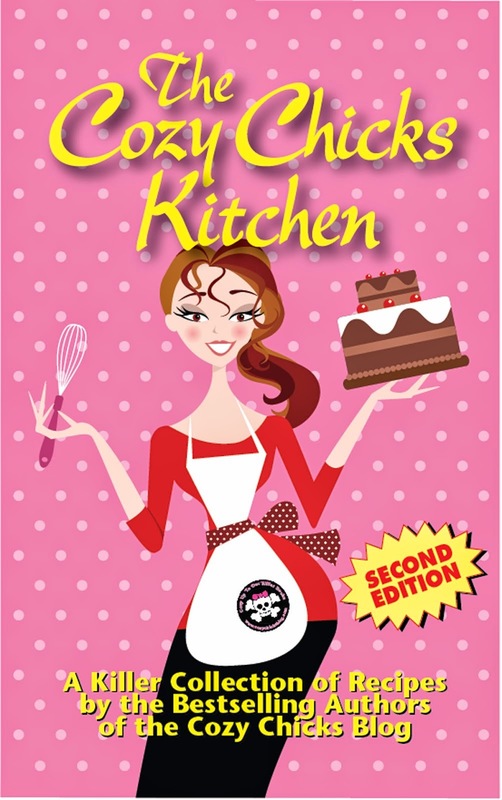 Cozy Chicks: It’s all about fun! Okay, it’s summer and hot and that means it’s time for amusement parks and blue ice cream and flying saucers and roller coasters and merry-go-rounds and things you eat on a stick. I’ve never been to Disney but we've taken vacations to Cedar Point here in Ohio and to King’s Island. 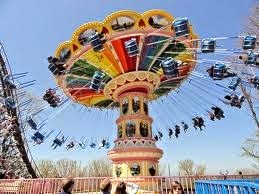 So my question today is... What is your fav amusement park and what is your fav ride now or when you were a kid? Are you a roller coaster person? Hands up, front car, screaming your head off. Or are you a stand on the ground screaming at your kids to hold on! What about those rides that are not only roller coasters but flip you up-side down? I am so not an upside-down person! What about those drop rides that take you up and up and up then cut the cord and you drop like rock. Personally a falling elevator has always been one of my nightmares. Then we have the rides that go around and around. Like the tea cups at Disney. 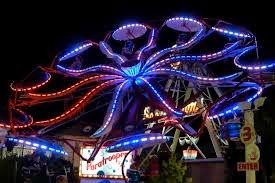 At Cedar Point they have this octopus ride that goes up and down and around. Not great after just eating a chili dog. Are you a flying swings person? This is great on hot days so you can get cooled off. Water rides are another great get-cooled-off ride but then you look a soaked mess for the rest of the day and really a bad idea if you are in a thin T-shirt. Oh Lordy! Merry-go-rounds are one of my fav as King’s Island has vintage horses that are hand-painted and so lovely. My daughter worked this ride for a summer. Loved it and still hums Bicycle Built For Two when she’s bored...the calipee music does tend to stick in your head after a while. What about the dodgems? Where you drive a little cart and try and ram people. We have our own version of this on the interstate here in Cincy. Personally my fav is the food. Not exactly a ride but I got a thing for blue ice cream and chilidogs and kettle corn and of course we all know that anything eaten at an amusement part is calorie-free. Soooo what is your fav amusement park or state fair and what is your fav ride? I’ll give away two of my romance books from the answers. 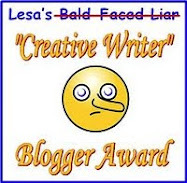 Please check back to see if you are a winner. Have a great summer! And most of all keep riding and have fun!!!! Since I'm a Brooklyn Girl I always had Coney Island. I'm talking about a Coney Island where Steeplechase Park hadn't been bulldozed out of existence yet. We had the Steeplechase horse ride, slides made from polished wood and lots of game machines. I rode the Cyclone only twice in my whole life, it was too much for me. Then we had the bumper cars and the Wonder Wheel, and of course the Carousel ride. So much for teens to do back in the early 60's. My favorite was Riverview here in Chicago, but it's been closed for decades. They had a water ride, the Chutes, and if you learned when to duck you could avoid getting drenched. Now we have Six Flags Great America which is especially fun in the fall when they have their Fright Fest. That's were I was introduced to Dippin' Dots ice cream. I'm a DisNerd, so I love Disneyland. I live about an hour away and don't go nearly often enough thanks to the high prices. I live in the same town as a Six Flags park, and I do enjoy all their various roller coasters. Being turned upside down and backwards and forwards is a blast as well. Unfortunately, as I'm getting holder I can't do quite as many rides back to back as I used to be able to do. Long lines can be good in those situations. I've been to Disneyland a few times (my first trip there was for my high school senior class trip in the 70's), and near DL is Universal Studios, but they are a 10+ hour drive. We also have a Six Flags a little over an hour away. But when I go to those places I usually prefer the shows. In DL, I loved taking my grandniece around to meet all the characters. But, as far as the rides - I have vertigo, so I'm not big on things that move around a lot. Over the years I've tried a lot of rides and usually ended up feeling ill, so they are not exactly great memories. When I was younger, I enjoyed the shows with animals - until I got older and realized that many are not treated well, which kind of spoiled it for me. So, I haven't been to an amusement park in a lot of years. But once my great, grandniece is old enough to enjoy it, I'm sure I'll take her to Disneyland (but I'll probably take someone else with me to go on the rides with her). I love carnival/amusement park/fair food. The NY State Fair is something I always look forward to. I do love the rides that zip you around in a little car on a track, taking you forwards and backwards. I haven't been on a really decent ride though since we always have our two year old with us now. I am looking forward to this year so we can take him on some of the little rides! Also, I love dippin dots ice cream and bloomin onions. YUM. Dodgems is a great name for that ride. We call them bumper cars and that is my husbands favorite ride! These are fabulous photos and bring back a lot of memories!! I always spent my summers in New York and I loved Playland and Palisades Park. 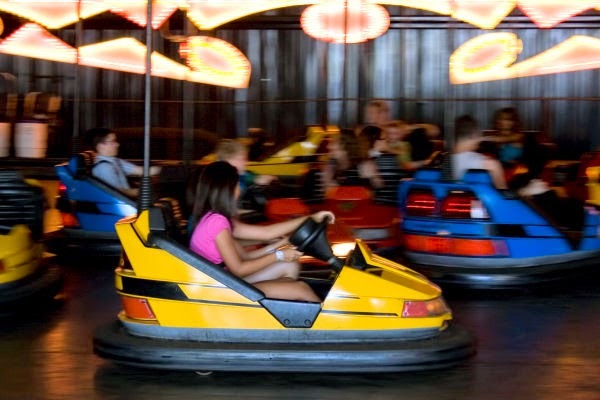 And my kids loved bumper cars and bumper boats--great fun! I so want to get to Coney Island one of these days. Sounds like an amazing place. My daughter lives in NYC. She’s been out there in the winter. It’s pretty neat then too. Daredevil Mark!!! Come to Cincy. Kings Island has some terrific coasters. 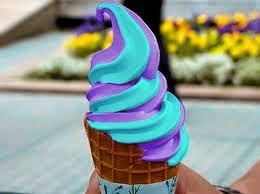 We can have blue ice cream together. Hi, Lynda. Taking kids to the parks is the best. Pure magic and they have such a good time and that’s a good time for me too. One of these days I need to get to Disney. Another daredevil! I so envy you guys. There are some really wicked coasters out there to ride these days. A two-year old! What a joy. Have fun. You can introduce him to dippin dots. The kids just love the rides. State Fairs are a blast. Have fun! We used to go to Willow Grove Amusement park and ride the roller coaster. It is now stores. 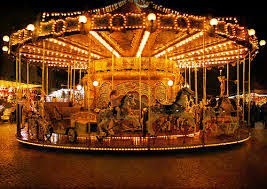 I now like to go on merry-go-rounds and have been on one in Disneyworld and one in San Francisco. Hi, Melanie! Okay, you made me a believer. I really want to get to Disney after reading your post. I live in Cincy so it’s a trek for me too. I need to put this on the bucket list. Hi, Mary. Lots of great memories with the kids at the parks. They have no fear…they leave that for their parents. LOL. Hi, Rachelle. I loved the older parks that every city seemed to have but I need to get to Disney and visit San Fran. Lucky you to live in such a lovely city. Oh, boy! That is a tough set of questions, because I love amusement parks. I just hate the wait. 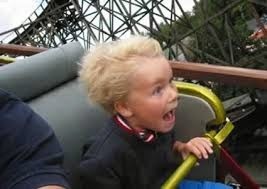 My favorite memory is going to Hershey Park. My dad dared all of us to eat a sub sandwich, immediately followed by going on the roller coaster. Of course, we did! None of us threw up, thank goodness, but my middle brother was a bit pale. Dad still is full of fun. My least favorite experience was at Great America in Gurnee, IL. I was on the ride where the floor drops, and someone was wearing a baseball cap, which fell off and got stuck in the floor. The floor wouldn't pull back up. The ride had to continue until someone was willing to crawl down the floor and use their toe to loosen the cap. Needless to say, something unpleasant continued to fly past us as we went around and around. Upon completion of the ride, we were congratulated for being the world's longest riding participants in the history of the ride. I love eating fair food. Hands down, the best fair was the Peoria County Fair in Peoria, IL. My dearest friends were showing their pigs. At the end of the three days of show, the sponsor invited everyone to have pork sandwiches on him at the food tent. He was a butcher, and it was fresh, fresh, fresh! Rocky Point was a favourite amusement park where I grew up, it was right on the ocean and had THE BEST chowder and clam cakes! My favourite ride was the flume, nothing better on a hot day to cool down with a ride on the flume. Me and my cousin would spend all day on that or in the haunted house. We loved the arcade games and to top the whole day off was dinner in the large dining hall. Chowder, clam cakes, corn on the cob, steamers then watermelon or ice cream for dessert. We would sometimes wander up and down the beach before heading back into the park and hit the rides again. Sadly it closed down quite a few years ago but I have so many happy memories of that place. I have favorite rides at certain parks. I've been to Cedar Point and lovveee the Iron Dragon, a suspended roller coaster that doesn't give whiplash and has me laughing my head off every time I rode it. I loved King's Island when I was younger and could ride roller coasters, The Beast was amazing, but I loved the racing coasters with the one that went backward. Kennywood close to home was a simple ride called the Kangaroo and a wooden roller coaster (for some reason the name has popped right out my head, it was there a minute ago, lol). I don't do heights so that lets out quite a few rides. I like Six Flags and King's Island. But, the most fun was the Texas State Fair Midway. At one time when I was evidently brain damaged, I loved the Roller Coaster, and there was a smaller version just as scary, called The Wild Mouse - thrilling and fun. I loved the Octopus, but got to the point it made me nauseated. The beautiful Carousel there, horses and creatures carved by European artists was a joy. The food ---corny dogs and cones covered with chocolate and nuts and cotton candy and the lemonade which made me pucker. 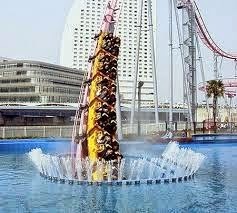 All in all, I think that up until recently going to an amusement park was fun whether I was going as a kid myself or taking my children and watching their joy at the same things I loved. Thank you Duffy for reminding me of the fun. Parks I like Knotts Berry Farm. But "rides", my favorite was a haunted house where there were rooms of mirrors and moving floors and other surprises. Holy cow, Margaret! I cannot imagine being stuck on that ride for that long. Yikes. Kudos to the guy who rescued you all. ;-) County Fairs are so neat ‘cause they highlight the area. Love the fairs. Oh, Patricia, I have so many fond memories of Cincy Coney Island too. Loved that place. Pure magic on a summer night. Went dancing at Moonlight Gardens. Romantic beyond words. Oh Chirs, Rocky Point sounds amazing. Love the haunted houses. A little cheesy but that was all part of the fun. We had one that was the Lost River with a bit drop off over a falls at the end. Loved it! Hi, Debbie. Cedar Point is the best with begin right there on the water. Lovely. I ride the racing coasters at KI too! The one roller coaster that doesn’t’ scare the heck out of me. Hi, Annette. I loooove the Wild Mouse!! We had one at Coney Island here in Cincy and it was crazy fun. The Carousel horses are amazing. My daughter loved working that ride. Lots of good family memories at the parks. Hugs. Patricia, Old Coney still has rides, in case you haven't been there in awhile. I live less than two miles from there, and spent many a summer's day there with my kids. And after 35 years of child-rearing, I don't care if I never go to another amusement park. We took our two youngest to Disneyland, and they were so bummed that we weren't going to Disney World in Florida, but I had tears in my eyes. Disneyland was where Annette and the Mouseketeers were when we were kids!! PS My oldest daughter was married at Moonlight Pavilion in 2000, Duffy. They've done such a nice job of making Old Coney even more beautiful, haven't they? Love funnel cakes!!!!!! Yummm. I always get the powdered sugar down the front of me. Part of the goodness. 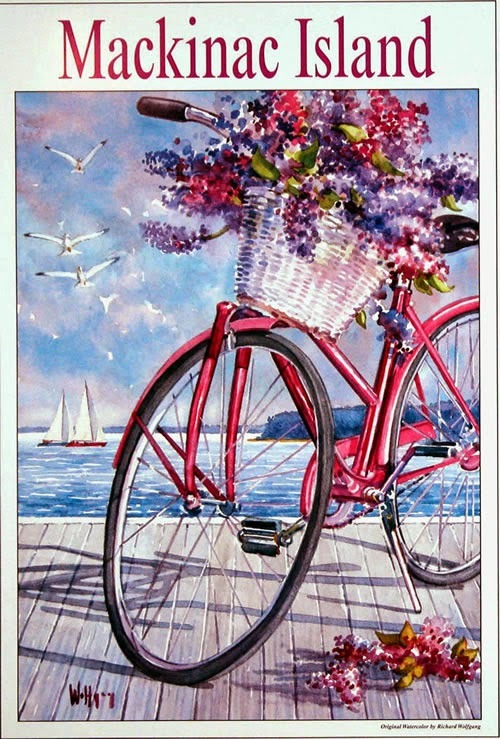 I love Mackinac Island. Wish I was there. So peaceful. YES! The Mouseketeers! I had ears, did you have ears. Looove Annette. I wanted to be Annette. Oh, Karen. What a lovely wedding indeed! I need to get back there. Maybe I’ll take grand baby and we can play. Thanks for the headsup! No ears, darn it. But all the boys, including my husband, had the hots for Annette! When I would spend the summers in Milford, kings island was coney island. They had pony rides. Those were my favorite. The food then and now is always the best....corn dogs, cotton candy, bright red candy apples. Nothing ever tasted as goos as when I was a kid. Oh, Shareleen, I so need to do Disney. And Hawaii…what fun is that!!! A trip to the amusement park cheers everyone up! Thanks! 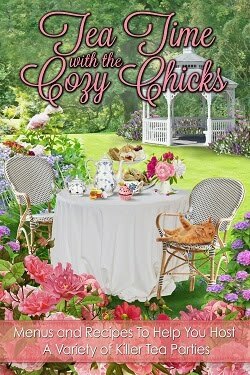 Winners of the romance novels are Heather and SueAnn. Email DuffyBrown@DuffyBrown.com with you mailing address and I’ll get the books out to you.